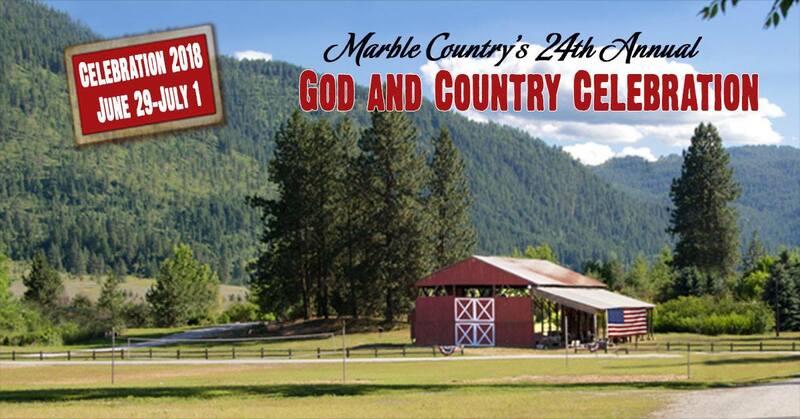 This year the theme for our 2018 God and Country Celebration ––the 24th annual––is “Marble Country Family Camp and Reunion.” We suspect that many of you face the same dilemma as the citizens of Marble Country: a deficit of quality time for rest, relaxation, recreation, and rejuvenation. Christian Patriots far and wide engage the battle to restore our land to her godly foundations against overwhelming odds and abuse We don’t complain because abuse goes with the territory, but occasionally we must take the time to get healed up. So what does all this mean for our many friends who would like to join us at our “marble Country Family Camp and Reunion?” We anticipate a delightful time of fun, fellowship and inspiration. Food vendors will provide meals and coffee. The barn will ring with speakers’ presentations and great entertainment. Unlike past years, we won’t run multiple workshops or back-to-back speakers, but count on barn dances, talent shows, concerts, volleyball, softball, and other games, as well as children’s activities in abundance. For the warriors among us, airsoft wars are scheduled for those who bring their own equipment. And of course, bonfires and fireworks will light the darkness and stir our souls in the tradition that patriotic generations have experienced since the days of our Founding fathers. Otherwise, fellowship time, strategic small groups, and warfare prayer sessions (for those so inclined) will round out our time together. If you are able to come, we will be delighted. All ages will have a blast! If not, plan on our normal no-holds-barred Celebration next year. Get it on your calendar now: June 24-30, 2019! Admission is free, but we need a little information to know how to prepare, so click on the links below for more information! LOCATION: Beautiful Marble Country, Washington – 3383 Hwy 25 N – Northport, WA. A Rally in Support of Liberty State! Newport, WA! March 31st!